Your comprehensive guide to the highest quality wooden chess tables on the market of 2019. Many antique wooden chess tables are available at estate sales and auctions. Sometimes you can find a great deal at these types of places if you’re in the market for a used table. Other times, you may be able to find a really rare or unique piece. If you’re not a collector, though, and really just want a nice wooden chess table for your home, it may be best to buy new so that you don’t bite off more than you can chew. The condition of the table is something that you’ll want to take into account if you’re buying a used or antique table. If possible, make sure to view the table in person before you commit to buying it. If you’re buying a new table, you won’t have to worry about this, since any New Wooden Chess Table will be shipped to you in an unused condition. Wooden chess tables are often thought of as being a traditional, classic furniture piece, but the truth is that there’s no reason wooden chess tables can’t have a sleek, modern style! In fact, you can find wooden chess tables designed in almost any style that you like. Think about what works with the existing decor of your home and find a chess table style that will complement that. Of course, you’ll also need to ensure that the price of the chess table fits within your budget. Before you start shopping, consider the amount you’re willing to pay and only look at wooden chess tables within that range. You’ll be much more satisfied with the table you eventually buy if you avoid gawking at wooden chess tables that are well above your price range. Another wooden chess table with an alabaster inlaid chess board, this one offers a dramatic single pillared design. Every inch of this table is handcrafted with care by a dedicated artisan, so the utmost in quality is assured. This is a standard sized chess table – the most common size – and the chessboard measures 23.5 inches square. The 23.5″ Alabaster Chess Table stands just under 28 inches off the ground. Each of the alabaster squares are 2.5 inches across, and the two incorporated storage drawers in this wooden chess table with unobtrusive brass handles each measure 11″ x 11″ x 2 1/2″. The chess table doesn’t come with chess pieces included, although they can be added onto the package for an additional fee. This is a very sturdy and solid wooden chess table. It is handcrafted from fine Mahogany wood which is polished to a shiny finish. The square base of the table rests on four supports that form a firm foundation for the single sculpted pillar that rises from the base to support the game playing surface. 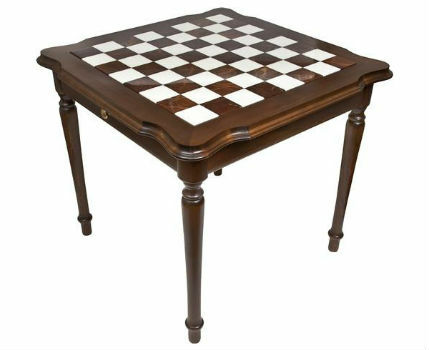 The 23.5″ Alabaster Chess Table can be had for a great price, especially considering that this is one of the best wooden chess tables on the market of 2019. For most buyers, this will be the perfect chess table, and it has our wholehearted recommendation. 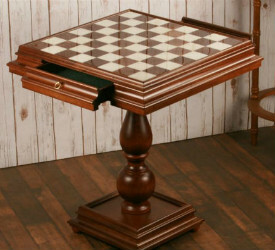 This elegant chess table is made with natural wood and stone, polished to a shiny finish. 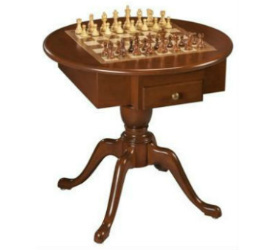 The Genuine Italy Wooden Chess Table features a traditional, almost old fashioned style that exudes luxury. Its spun legs and scalloped corners evoke classic craftsmanship and give this piece an authentic antique feel and look. The dark walnut finish of the wood make it a perfect addition to a masculine study or upscale man cave. Each 3.125 inch square of this table has been carefully cut from white and marbled brown alabaster and inlaid in the tabletop by hand. Chess pieces are not included with this wooden chess table, but the expansive playing surface can easily accommodate any set of chess pieces with bases that are 2.75 inches or smaller. There are also two large storage drawers each measuring 23 1/2″ x 12 1/2″ x 2 1/2″ on either side of the table to store your pieces when they’re not being used. The wooden chess table is a high end, luxury piece with a price to match. If it’s within your desired price range, you definitely won’t be disappointed if you buy this gorgeous chess table. This wooden chess table has a unique design to it. 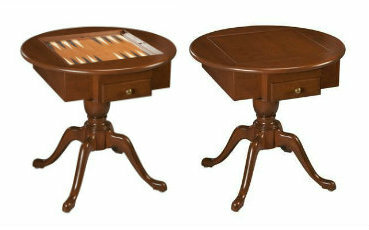 It stands on four legs, and the central column supports a tabletop that is round on the top, but square on the bottom. Definitely a unique look that you don’t see every day! The US Made Round Pedestal Wooden Game Table is also an eco-friendly product, making it a great choice for the environmentally conscious consumer. It is made from solid Cherry wood that is not only beautiful but also certified eco-friendly by the Sustainable Forestry Initiative (SFI). This wooden chess table also includes a set of beautifully crafted, Staunton style chessmen. The pieces are generously sized, with a King that stands 4 inches off the board. The chess table itself is quite large, with tabletop dimensions of 39.5″x40.5″x7″ the chessboard itself is 20 inches square, and because of the high quality, solid woods used in this table’s construction, the tabletop alone weighs over 60 pounds! 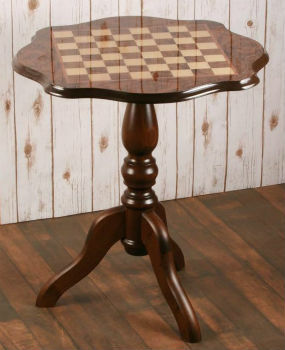 Still, its rounded shape makes this chess table easy to work into any room. 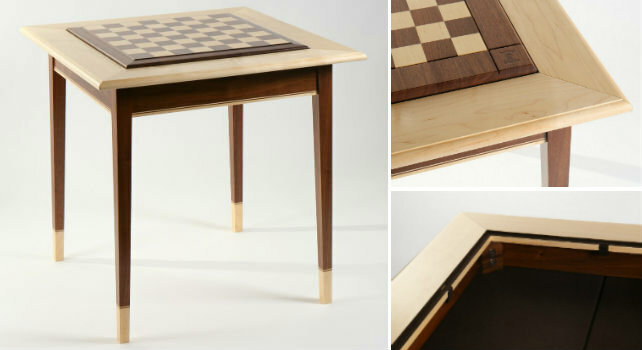 This gorgeous wood table isn’t just for chess, though. It also features playing surfaces for checkers and backgammon, with the pieces included! They come stowed within the table’s storage drawers, and that’s a feature that you really don’t see too often. Many game tables will come with the boards for other games, but not the pieces. This adds extra value to a wooden chess table that is already a great buy. 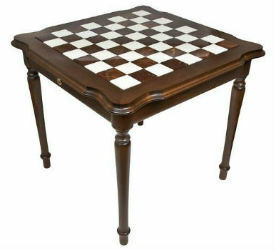 The Sorrento Chess Table is a compact wooden chess table that comes at a great, bargain price. It is handcrafted in Italy and imported in three separate pieces- so some simple assembly will be required when it gets to your home. Don’t be intimidated, though! It’s really quite simple and the money you save on this product as a result is well worth the few minutes of time that it will take you to put this chess table together. This simple and classic wooden chess table is made of a mixture of mahogany, briarwood, maple, and walnut woods. It features an inlaid mosaic border around the chess board surface as well as a high gloss finish that gives it an added luxurious touch. It features a sleek design with a thin top piece, which looks good but means that there’s no room for interior storage drawers, unfortunately. This wooden chess table also doesn’t come with any chess pieces included, but you can add some to your order for a small additional fee. The Sorrento Wooden Chess Table is a great budget option with a timeless design. It will fit in with any decor and is compact enough to fit into small corners and other tight spaces. Because of its lack of storage, it may be best used as an inexpensive platform to display decorative chess sets, although it can certainly be used for active gameplay if you so choose. Now that you’ve seen a few of the best wooden chess tables on the market of 2019, you may be surprised by how much you like them. Or, maybe you weren’t very impressed. That’s ok, too. If wooden chess tables just aren’t your style, don’t worry! There are plenty of different materials to choose from in 2019. By now, chess tables come in a wide variety of materials including glass, plastic, concrete, metal, acrylic, and many more. While the wooden chess tables tend to have a more traditional design, other materials open up the door to more modern styles. We have several different pages on this site dedicated to reviews of different types of chess tables available in 2019, so don’t give up your search just yet. Check out our main chess tables page as well as this one dedicated solely to antique chess tables to see more options. If you do have your heart set on a wooden chess table, you absolutely can’t go wrong with any of the tables on this list. They have all been thoroughly vetted by us to ensure their level of quality and craftsmanship. If you’ve seen one that you absolutely love, don’t wait to purchase it. It may seem like it will always be there for you, but online stock can rotate and change unexpectedly, so we recommend buying as soon as you are able if you absolutely have your heart set on a certain chess table. We’d hate for you to be disappointed! The Best Chess Table: List of the Best Chess Tables of 2019. The Best Antique Chess Tables: List of The Best Antique Chess Tables on the Market.